This baby snack using delightful Marcona almonds from Spain is so quick and easy to make that you'll be eating these all year round and not just during the holidays. Marcona almonds come from south eastern Spain and are rounder, flatter and softer in texture than standard almonds. They have also been described as buttery with a slightly sweet taste to them and are the perfect complement to dried figs. Dried figs have a sweet and sticky texture, which is nicely offset by the mild tasting and crunchy Marcona almond. 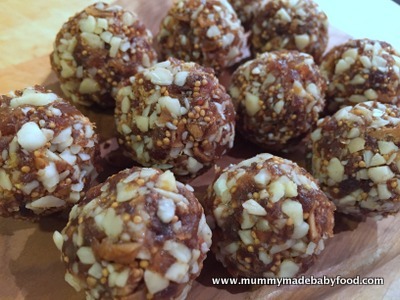 This intensive hit of protein and fibre is the perfect baby snack to keep your little one going. It can sometimes be hard to fit sufficient fibre into your child's diet, especially if he has an active lifestyle and is constantly on the go. These little bites are nicely portable, making them easy to take along anywhere. The recipe below also includes lemon zest and ground cloves, which add an extra dimension to these snacks, making them irresistible. Feel free to go easy on the cloves, if you think your little one might not like it. I've also included a bit of raw honey as an optional ingredient, in case you find the mixture too crumbly and not holding together well; I found I didn't need the extra sweetness from the honey. If you squish the mixture together with your fingers - rather than roll it between your palms - and shape them into balls, they should hold together nicely. A word of caution - make sure you use raw (and blanched) Marcona almonds and not the roasted and salted version! Roasting and salting is a popular way to enjoy these almonds but not what we need here for this recipe. If you are struggling to find raw Marcona almonds near you, raw and blanched standard almonds will do just fine, and your little one will still be able to enjoy all the nutty health benefits. This snack is suitable for an older baby or toddler who has developed confident chewing skills, as the texture of nuts and dried fruit can sometimes be hard to manage; you could process the fruit and nuts to an even finer texture to make it easier for a younger baby to eat. Place the almonds in a food processor and blitz for a few minutes until they break up into uniform small pieces. Add the dried fig pieces, cloves and lemon zest, and blitz for a few more minutes until the fig is broken up and the mixture well-combined. With the motor running, drizzle in the honey, if using, until it has been fully incorporated. Remove the food processor bowl from its base, scoop heaping teaspoonfuls of the mixture into your hand, and squeeze and press together firmly whilst shaping it into a ball.